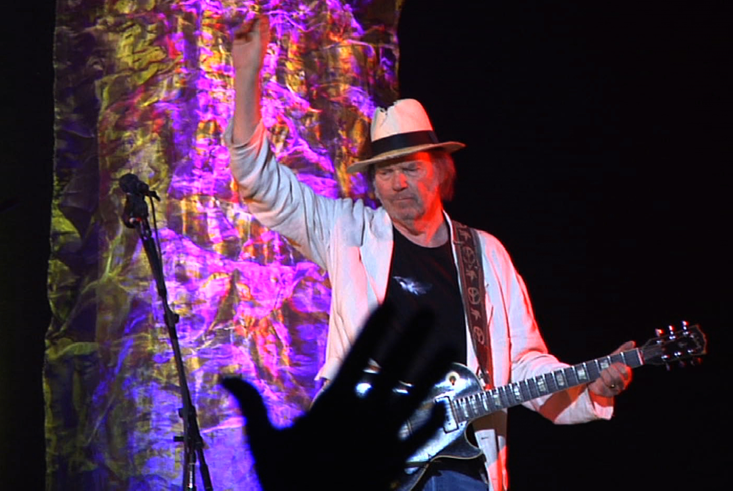 Some of the hometown landmarks Neil Young recalls during on-the-road segments of this concert documentary may be long gone, but the singer-songwriter himself remains enduringly iconic after nearly a half-century of rocking in the free world. "Neil Young Journeys" is the third collaboration between Young and director Jonathan Demme, following 2006's "Neil Young: Heart of Gold" and 2009's "Neil Young Trunk Show." Most of the new film was shot at a solo concert where Young performed more than a dozen songs dating from the 1960s to his 2010 "Le Noise" album, along with the previously unreleased "Leia" and "You Never Call." Young's amusing behind-the-wheel anecdotes take the place of any between-song patter. "We just passed Goof Whitney's house," he notes at one point on the drive, recalling a childhood friend who convinced him that road tar would start tasting like chocolate after enough chewing. Like "Neil Young: Heart of Gold," "Neil Young Journeys" refreshingly includes almost no audience reaction shots. Keeping the focus on Young is a good thing, but director Demme occasionally takes the up-close and personal touch too far. A tiny mike-stand camera is focused ridiculously near Young's beard-stubbled neck for some aggravatingly extended shots. During "Hitchhiker," one of six songs from "Le Noise," a fleck of the singer's saliva hits that camera's lens. The rest of the song plays out through the blurred blotch it left behind, which may be a little too cinéma-vérité for some viewers' sensibilities. Demme makes up for that lapse with things like a moving montage of news footage from the 1970 Kent State shootings that plays during Young's monumental rendition of his angrily bitter "Ohio." Including the names and faces of the four students killed by National Guard troops during that anti-war protest could have come off as tacky if not for the obvious sincerity of Young's undiminished "what if you knew her and found her dead on the ground" outrage. Young accompanies himself mostly on electric and acoustic guitars, plus occasional piano, organ and harmonica, with enough widescreen, room-filling sound that it's hard to believe he's on stage alone. The audio is impeccable, making it a shame there won't be a soundtrack CD. Grizzled and utterly un-flashy in a battered hat and rumpled sport coat, Young is one of the few 1960s survivors who still sounds as vital, engaged and interesting today as he did nearly five decades ago. His playing is dazzling, his songs are timeless, and "Neil Young Journeys" is a trip worth taking.